The Warmth of Other Suns: The Epic Story of America's Great Migration (2010) is an amazing work of scholarship, documentation, and artistry. Wilkerson traces many threads of the Great Migration and the Second Great Migration, allowing us to tag along as southerners made their way north. The book is a really expansive treatment of black history, culture, and movements. While the book is rightly recognized as a historical study, Wilkerson demonstrates her excellent capabilities as a storyteller. She artfully weaves many threads into the narrative. In some respects, The Warmth of Other Suns is a complement to countless poems, songs, paintings, novels, autobiographers, and other works that have presented the saga of black folks traveling from the South to the Midwest, West, and Northeast. 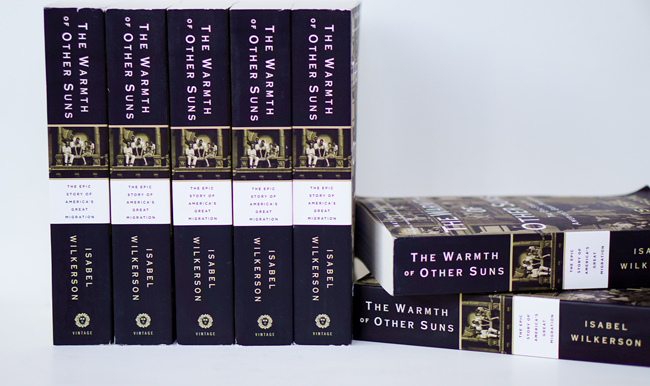 The powerful interconnectivity of Wilkerson's work makes The Warmth of Other Suns all the more relevant for our considerations of Black Book History.